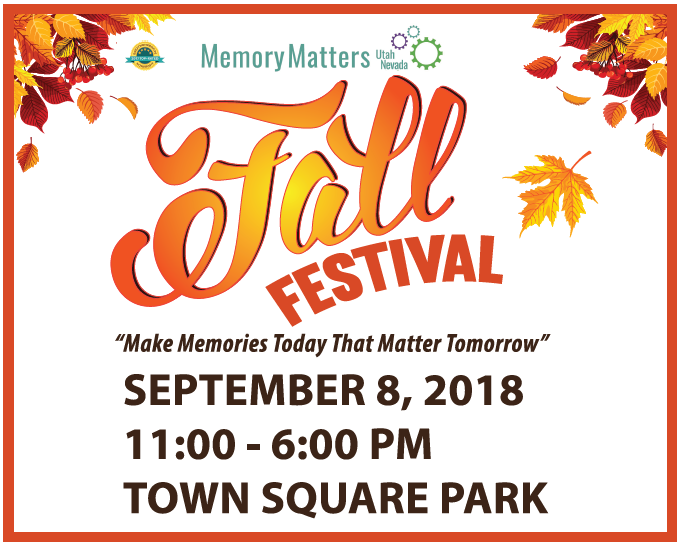 ST. GEORGE — Memory Matters Utah/Nevada is putting on a “Fall Festival” in downtown St. George to raise awareness of services and help available for memory loss conditions, such as dementia and Alzheimer’s disease. The festival will be held Saturday from 11 a.m. to 6 p.m. at Town Square Park in St. George. The public is invited to attend the free festival, which will include a wide variety of events. The festival will feature vendor booths, food trucks, live entertainment, family portraits, prize drawings, a memory wall and a balloon release in the evening. All prizes are donated from area businesses. Donations for event prizes can be made to Memory Matters and may be tax deductible. All proceeds from the Fall Festival go to assist Memory Matters in support of the organization’s mission of reducing isolation and improving wellness for individuals with dementia and their caregivers through activities, support, education and consultation. Programs provided by the nonprofit include caregiver support groups, education classes, early stage intervention and dementia activity classes providing respite for caregivers. The Fall Festival is presented by Brookdale Senior Living Solutions, Care to Stay Home and Integrated Senior Care and sponsored by St. George city, FERN Expositions Events Experience, Stapley Pharmacy, Estate Protectors, Steamroller Copies and Memories to Frame Photography. For more information, contact Memory Matters Utah/Nevada at 168 N. 100 East, Suite 104, St George, by phone at 435-319-0407 or by email at [email protected]. When: Saturday, Sept. 8, 11 a.m. to 6 p.m. Details: Learn more at the Memory Matters website. Please refrain from the Balloon release. They’re an ecological disaster and we need to wisen up and move on from destructive traditions.